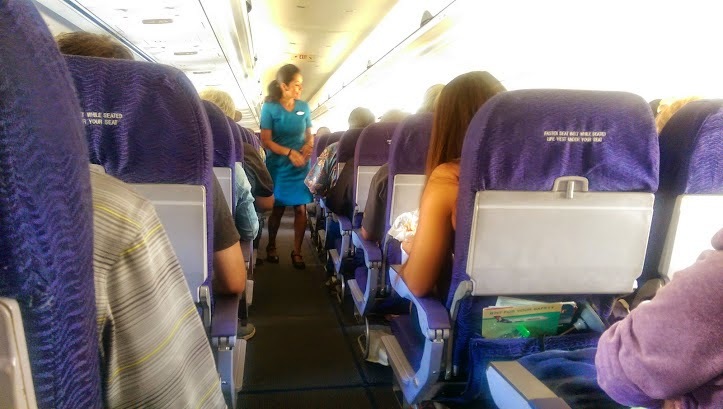 Hawaiian Airlines passengers won't be able to recline their seats on any interisland flights by the end of this year. The state's largest carrier said Thursday it is retrofitting the 18 Boeing 717 aircraft it uses on interisland routes with new lightweight seats that will reduce legroom by about an inch under a reconfiguration and allow the airline to add five to 10 more passengers on each flight. Star-Advertiser. The state's chief elections officer would have to undergo a performance evaluation after each general election under a plan approved by the state Senate. The bill, SB 622, requires the Elections Commission to provide the written performance evaluation to the Legislature. Associated Press. Despite concerns from the departments of Health and Human Services, Hawaii lawmakers are pushing forward bills that would help the adult care-home industry make more money while potentially compromising the quality of services provided to those most in need. Civil Beat. A bill that would make an exception for married couples who do not receive Medicaid to live together in the same Community Care Foster Family Home is advancing through the state House of Representatives. Star-Advertiser. As a mark of respect for the late former state Rep. Diana “Mele” Carroll, Gov. David Ige has ordered that the flags of the United States and State of Hawaii shall be flown at half-staff at all state offices and agencies, as well as the Hawaii National Guard, from sunrise to sunset Friday to recognize services held on Oahu and Sunday, which is the day services will be held on Maui. West Hawaii Today. The commercial solar energy market in Hawaii has turned into a race of sorts, a race for businesses to get their systems in place before a federal tax credit sunsets at the end of 2016. Pacific Business News. The City Council Zoning and Planning Committee gave a preliminary thumbs up Thursday to one landscape-changing development scheme and a thumbs down to another one. A rezoning request for D.R. Horton Schuler Division's 11,750-home Hoo­pili project in West Oahu advanced 5-0. But Hawaii Reserve Inc.'s plan to develop a section of Malaekahana, between Laie and Kahuku, appears to be in serious jeopardy. Star-Advertiser. The Honolulu City Council Zoning and Planning Committee approved a planning document for the North Shore on Thursday but amended it to remove a highly controversial new residential community at Gunstock Ranch in Malaekahana. Civil Beat. Ho’opili, a major residential and commercial project on O’ahu cleared its first major hurdle today following the completion of public testimony before a Honolulu City Council Committee. Hawaii Public Radio. A Honolulu City Council committee has advanced a proposed development in West Oahu. The council’s zoning committee gave the green light Thursday for Hoopili’s next step. KHON2. One controversial housing development has hit a major roadblock, while another in Kapolei has been given the green light to go ahead.The Honolulu City Council's Zoning Committee approved Bill 47 without including Envision Laie, a proposal that would have included nearly 900 new homes at Malaekahana in the Koolauloa section of Windward Oahu. Hawaii News Now. After more than four hours of testimony Thursday, the City Council’s Zoning and Planning Committee approved the removal of language from the Koolau Loa Sustainable Communities Plan that could have paved the way for 875 homes to be built on land at Malaekahana. KITV4. Oahu communities roundly oppose Malaekahana development. At a press conference today, the opposition to Malaekahana development expressed their reasons for supporting zoning chair Ikaika Anderson's proposed amendments to Bill 47. Hawaii Independent. Elected leaders at Honolulu Hale and the state Capitol have been watching closely to see how their colleagues across Punchbowl Street will respond to rail's budget crisis. Now at least one Hono­­lulu City Council member appears concerned that his chamber might have waited too long to weigh in on a rail tax extension. Star-Advertiser. Hawaii Pacific Health, the state's largest medical provider, is exploring a purchase of all or part of the financially struggling Wahiawa General Hospital. Star-Advertiser. Opinion: Oahu General Plan Provides Diversification and Sustainability. The Oahu General Plan is not perfect but it provides land-use diversification and sustainability for our small island home. Civil Beat. The state’s only new charter school is set to open its doors in Ka‘u in July, following unanimous approval of its facilities Thursday by the Windward Planning Commission. West Hawaii Today. Just over a year after North Hawaii Community Hospital merged with The Queen’s Health Systems, the Waimea facility is adding new equipment, rebuilding a management team and laying groundwork for stabilizing its workforce. Efforts to recruit badly needed doctors are also moving ahead, although more slowly than many would like, the hospital’s president Ken Graham told West Hawaii Today in an interview. Christina (Tina) Neal has been chosen to serve as the new scientist-in-charge of the U.S. Geological Survey’s Hawaiian Volcano Observatory. Neal succeeds Jim Kauahikaua, who served in the position for the past 10 years. West Hawaii Today. The Hawaiian Volcano Observatory's new scientist-in-charge is coming to Hawaii from Alaska where she has been mapping and studying active Alaskan volcanoes for more than two decades. Garden Island. Home prices on Hawaii's Big Island rose by single digits in February, while sales of condominiums rose and sales of single-family homes fell, according to data released by Hawaii Information Service on behalf of Hawaii Island Realtors. Pacific Business News. A Maui County Council committee decided Thursday to re-examine rules and guidelines in the county's transportation contract for residents with disabilities with Maui Economic Opportunity amid recurring complaints from riders. Maui News. The state Health Planning and Development Agency has ruled against Regency Namakua's application to build a 40-bed skilled nursing and intermediate-care facility at the Maui Research and Technology Park in Kihei. Maui News. Second Circuit Judge Joseph Cardoza and District Court Judge Adrianne Heely will hear Maui County's environmental cases when the new statewide environmental court program comes on line beginning July 1. Maui News. Legal costs and fees to defend County of Kauai officials in two lawsuits filed by county employees totaled a little more than half a million dollars before settlements were reached, according to documents obtained by The Garden Island. The state Department of Land and Natural Resources and private partners have launched a $1 million-plus project that aims to remove 15,000 tons of burned pine and eucalyptus trees, many of them dead and standing hazards, and then replant with healthy hardwoods, including a large section of natives such as koa. As part of the project, the logs will be hauled off to Kauai's new $90 million Green Energy biomass plant, where they will be burned to generate electric power. Star-Advertiser. The state has started cutting down trees on 300 acres of Kauai forest reserve that were scorched by wildfire in 2012 and sending the wood to be processed at a new biomass-to-energy plant. Associated Press. The median price of a single-family home on Kauai shot up by more than 46 percent in February as the median price on the North Shore passed $1 million, according to data released by Hawaii Information Service on behalf of the Kauai Board of Realtors. Pacific Business News.